The origins of the Saddleworth Rushcart are unknown but are unlikely to be before 1800. Academics now pour scorn on any suggestion that they are pre-Christian. However readers are asked to refer to James George Frazer's The Golden Bough where he analyses European mythologies of fertility rituals as related to trees and woods. The Rushcart was revived in 1975 by the newly formed Saddleworth Morris Men following research by Peter Ashworth who was fortunate enough to be able to listen to the memories of the last Rushcarts from one or two of the older members of the community. The story of the Rushcart can be found in Peter Ashworth’s book ‘Rushcarts in Saddleworth’. It records how Harold Buckley encouraged Peter and the other Morris Men to move beyond dancing and to re-establish the Rushcart. Doubt turned into determination and a cart was found at a local farm, stangs bought from George Hill Ltd and rope arrived from a mill in Delph. As Pete says in his book, ‘I don’t think they missed it.’ The rushes were cut up at Castleshaw and with the help of old plans, books and Harold, the Rushcart was built in the traditional location of the Uppermill Rushcart, the Commercial. The first revival rushcart was dismissed by one old-timer as ‘nowt [nothing] like a rushcart’. Nevertheless, the first Rushcart for over 50 years was ready, and on the Saturday morning emerged from behind the Commercial to renew the old tradition. The 1975 audience of about two is in contrast to the hundreds that now gather in Uppermill. Nowadays the rushes are cut during August at the foot of Pule Hill off the A62 road to Marsden and built behind the Commercial Hotel, Uppermill onto a two-wheeled cart in a slightly conical shape. It is 13 feet high and weighs 2 tons. The rushes are not tied on; they are secured by bolts of rushes at each corner that are held in place by metal rods. The cart is trimmed and decorated with heather and then on the Saturday morning the front is dressed with a banner made by a man chosen from the ranks of Saddleworth Morris Men who then sits astride the cart with only two Rowan branches to support him. He is supplied with Ale for the day in a copper kettle. The cart is then pulled around the Saddleworth villages by Morris Men from all over the UK and sometimes from abroad. There are usually 150 men on the stangs fixed to the cart by strong rope. On Sunday the Rushcart is taken to St Chad’s Church above Uppermill where the top is dismantled and in keeping with tradition the rushes are mixed with fragrant herbs and flowers and then symbolically spread in the aisles. 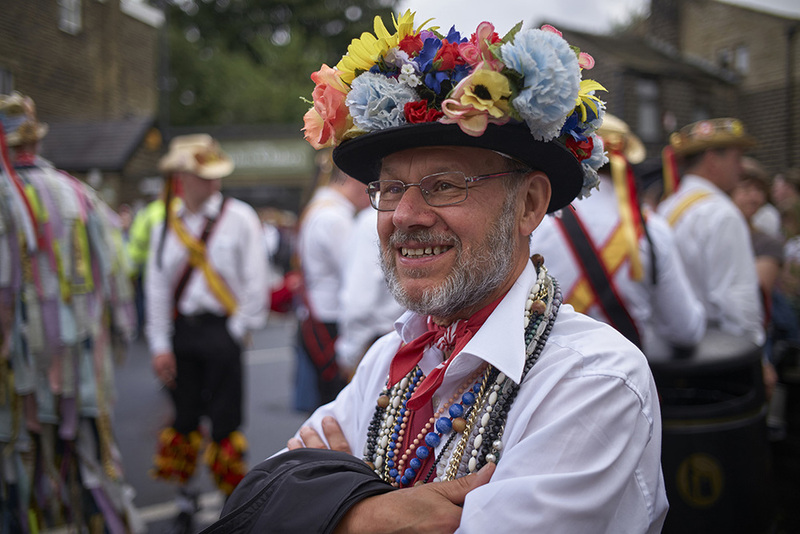 The Rushcart is now firmly established in a Saddleworth Calendar that includes the Whit Friday Band Contests, Beer walk(which is no longer held) and Saddleworth Folk Festival.